The OMRI Products List is a directory of all products OMRI has determined are allowed for use in organic production, processing, and handling. Applications for products are reviewed against the organization’s policies and standards based on the USDA National Organic Program Rule. Only those products that have passed this review are included in the OMRI Products List and can display the OMRI Listed® Seal — the organization’s registered certification mark. The OMRI Products List is the most complete directory of products for organic production or processing. The 2015 edition includes over 3,300 OMRI Listed® products. In the United States, the National Organic Program (NOP) is the federal regulatory framework governing organic food. It is also the name of the organization in the Department of Agriculture (USDA) responsible for administering and enforcing the regulatory framework. The Organic Foods Production Act of 1990 required that the USDA develop national standards for organic products, and the final rule establishing the NOP was first published in the Federal Register in 2000. Lady Bug provides Eco-Friendly service by using a natural material inside your home. We inject the material in the cracks and crevices where pests hide, yet it is inaccessible to children and pets, making it completely safe. We treat your home and yard using baits and other Eco-Friendly products to create barriers around your home and property. We also treat pests where they live and breed, which provides you with the best level of control while products that are National Organic Compliant and OMRI. 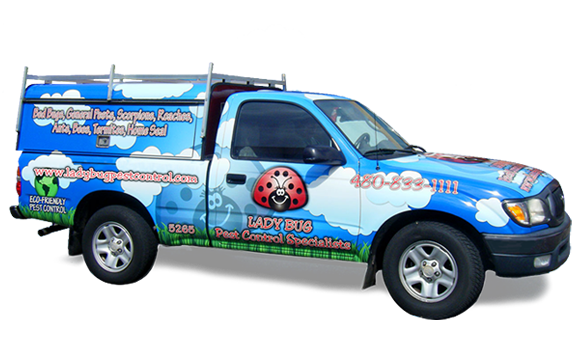 Contact Lady Bug Pest Control Specialists for a Free Home Inspection for Termites, Eco-Friendly Pest Control, Home Seal Service, Bed Bug Eco-Heat, and Rodent Control.